Note:a Chinese translation of this article has been produced by Harbour Times at this link. That the first HK$2m of taxable profit be taxed at 8.25%, being half the current 16.5% rate (the Tiered Rate proposal). Each "group of enterprises" (to be defined) may only nominate one enterprise to benefit from the break. That filers be entitled to a 300% deduction on "research and development" expenditure up to HK$2m, and 200% thereafter, rather than the usual 100% that applies to all expenses incurred in the generation of profit (the R&D proposal). We'll deal with these proposals separately. For many years in its budgets, the Government has been fiddling with Profits Tax by waiving 75% of tax up to HK$20k, effectively cutting the tax rate to 4.125% on the first $161,616 of profit. The $20k waiver has been available to each subsidiary of any group. It is a clumsy way of returning a small part of our structural surplus, when a fairer way is to cut the flat rate of tax when too much revenue is coming in. Now, the Government wants to give some permanence to this and scale it up to an effective waiver of 50% of profits tax, subject to a cap of $165,000. This incentivises anyone who owns and runs a company not to run it better but to structure their affairs so that rather than paying themselves a higher bonus (which is subject to Salaries Tax in bands up to 17%), they will now leave HK$2m of profit before tax in the company, pay 8.25% on that, and then pay out the taxed profit as a dividend. Quite rightly, dividends are not subject to tax, as they represent the distribution of taxed profit and no GDP is generated by paying out a dividend. So the Tiered Rate proposal will distort the economy by producing an arbitrage gap between the rates of Salaries Tax and Profits Tax. There's another problem. A large number of real esate properties in HK, including many high-end apartments, shops, office or godown units, are held by individuals via single-purpose companies. Your editor owns his flat that way. By introducing a large waiver (purportedly aimed at "Small and Medium Enterprises"), the Government is simply creating a tax break for property owners. A single-asset company which rents out a flat for up to HK$180k per month will have no problem keeping its taxable profit below HK$2m (after expenses, depreciation and refurbishment allowances), or at even higher rent if it has used a bank loan to finance the purchase. The Government hasn't yet defined a "group of enterprises" and whether that would include multiple companies owned by one human rather than a holding company, but even if they extend the meaning of "group" to all companies majority-owned by a human, a married couple can still hold one company each. Another way around the problem would be for two people to each hold 50% of each company, so that the tax-paying companies are not part of any "group", as they are not subsidiaries. Finally, if this is intended to incentivise start-ups or SMEs, then the Government has completely failed to understand what drives them. If you quit your relatively comfortable job to embark on a new business, possibly moving to HK to do so, you aim to make a much larger profit than HK$2m. What will attract you fiscally is lower overall tax rates, not a break on the first HK$2m. Some policy wonks in HK have wrung their hands at the low reported level of R&D by the business sector here, claiming that this means HK is "lagging behind". The truth is far more sanguine. Businesses will engage in as much investment in their products and services as makes economic sense to them, no more and no less. If they can make an incremental profit from the investment (after cost of capital), then they will do it, and they will be happy to pay the flat rate of tax on the additional profit - it is a "nice problem to have". But one reason that HK doesn't report higher levels of R&D is that, until now, there has been no reason to classify expenditure that way. When a company develops a new feature in its toasters, or a web site operator develops a new feature on its site, the costs involved (including labour and a share of overheads) are not separately identified. They are booked as normal expenses and deducted from revenue to calculate profit. There is no need to call it "R&D" when the Census and Statistics Department sends you a survey on expenditure, so you don't waste time and money segregating the expenses. Territories which introduce special tax treatment for R&D will see an instant increase in reported levels, not because business are necessarily spending more on it, but because they are reclassifying existing expenditure to qualify for the tax break. And that's just the summary. The HK Government hasn't said how it will define R&D, because it is really impossible to do so. If interpreted widely, vast chunks of expenditure will qualify, but if interpreted narrowly, it will just tie up large numbers of people arguing about the deduction. One thing is for sure: the proposal would increase the number of people in HK who do nothing but argue about the amount of tax that others have to pay. The big accounting firms are rubbing their hands with glee, but is that really how to make an economy more productive? "With years of practical experience in public finance, I fully appreciate the requirements stipulated in the Basic Law of keeping expenditure within the limits of revenues and avoiding fiscal deficits as far as possible. But the fact is the HKSAR Government last went into deficit in 2003-04." It's bad enough that we're draining the economy by running a surplus, but shen then spent the rest of her address talking about how to increase expenditure to match revenues, rather than reducing revenues to match expenditure. In citing the Basic Law, she ignored the third budgetary requirement in Article 107, to "keep the budget commensurate with the growth rate of its gross domestic product". In fact, HK has been breaching the Basic Law by growing its budgeted expenditure faster than GDP. 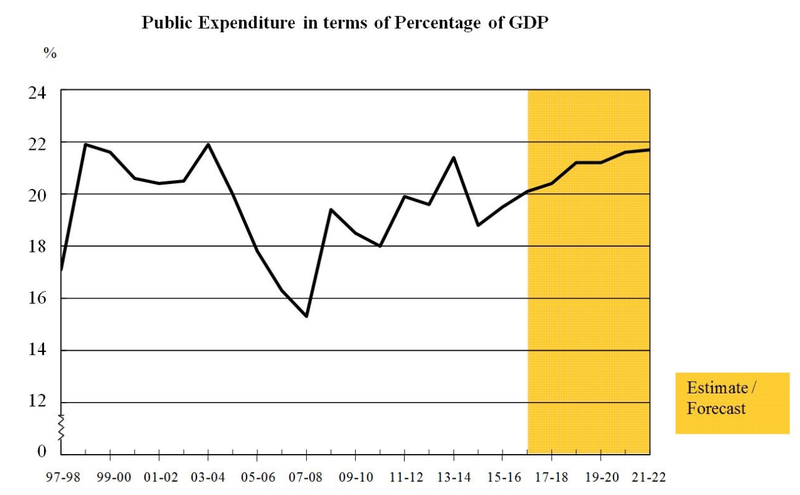 We entered the post-colonial era spending 17% of GDP in 1997-98, and the Government has budgeted HK$532bn or 20.4% of GDP in 2017-18, with a projection to reach 21.7% in 2021-22. A dedade of indiscriminate handouts and profligate infrastructure spending has caused this. Meanwhile, the amount of revenue sucked out of the economy is now closer to 24% of GDP, with the 4% difference being about $100bn in surplus. Salaries tax ($62bn) and profits tax ($139bn) are budgeted to raise $201bn in 2017-18, so even without cutting expenditure, we could slash tax rates on both salaries and profits to a flat 10% and still break even, not allowing for the stimulative effect on economic activity, including profits-shifting to HK from higher-tax jurisdictions in the region. But even if this measure results in occasional deficits when other revenues are slow, we should be aiming to do that and return some of the hoarded surpluses to the economy via lower taxation. We simply don't need that much cushion for armageddon. The Government has become so desperate to justify its hoarding that it has established a "Future Fund" within the reserves, the purposes of which are undetermined. The latest abridged balance sheet of the Exchange Fund at 31-Aug-2017 shows that fiscal reserves now stand at $986bn, plus $687bn of surplus in the Exchange Fund, for a total of $1673bn. The corresponding figures at 31-Dec-1997 totalled $623bn. So over the last 20 years (including the 1998 crisis and the 2003 SARs deficit) we have salted away over HK$1 trillion in today's dollars. We could also elminate the lower Salaries Tax bands (currently 2%, 7% and 12%) by expanding personal allowances. Currently the lower bands raise minimal revenue, and a 10% flat rate would obviously eliminate the 12% and 17% rates. To make the system both simpler and fairer, we should also eliminate the housing benefit loophole where rent reimbursed to employees (or quarters provided) is deemed to be worth only 10% of other cash income, and abolish the mortgage interest deduction which distorts the choice between renting and buying homes. All of this we have proposed before. For two decades, the Government has hoarded surpluses that it does not need for the foreseeable future. Now is the time to return the wealth to the economy, not with gimmicks and R&D deductions, but with straightforward tax cuts and simplifications. That's all the innovation we need from Government.